This color combo is not for the faint of heart. If you are looking for bold, fun & modern, then Cobalt & Chartreuse is a perfect fit. These analogous colors look great together in many tones, but if you are planning a later summer wedding, this color combo will be a fun pallet to play with. Cobalt glass is beautiful for place settings, and can be found at many resale shops too! Think apple martini signature cocktails for your guests, or blue parasols for a reception in the sun! Consider the Judy wedding invitation design for a late summer wedding. It’s a bold playful design that sets the tone well for your wedding! This is a classic color combination, and perfect for a spring or summer wedding. Dressing your bridesmaids in warm gray is complimentary to all skintones and is a great backdrop for soft pastel bouquets of any color.For additional accent colors you can use peach or gold as well! Consider using the Madison wedding invite design and throw in some nature elements (like birds nests and moss) in combination with something that sparkles to your decor! 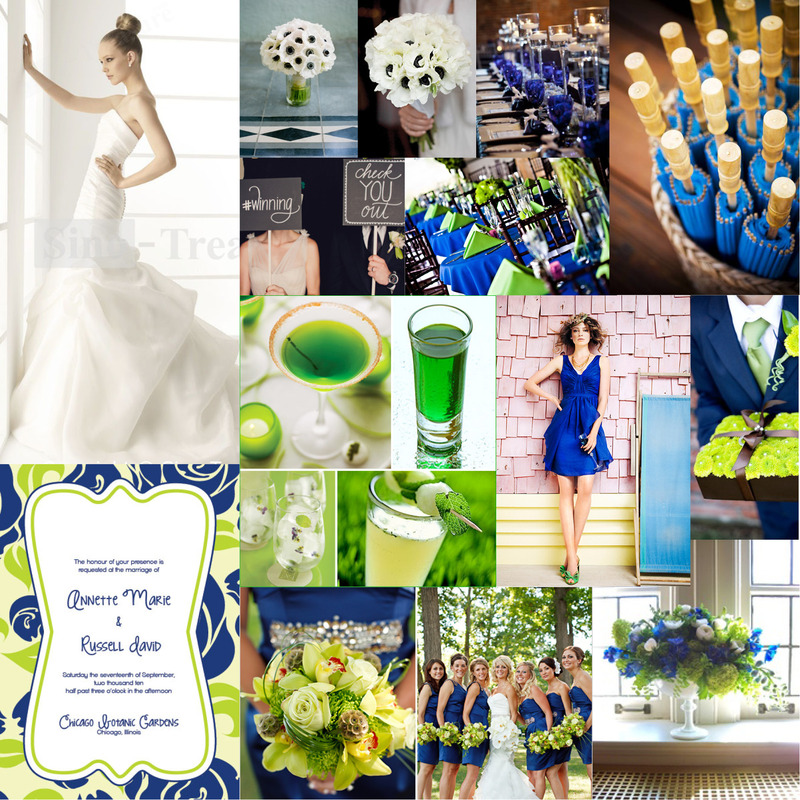 If you love bright exciting colors, and aren’t afraid to show it, have fun with Lemon & Lime as your wedding colors. I’m thinking July, hot summer, outdoor ceremony, lots of sun light and fresh air! Just think of the fun your guests senses will be having when they see, smell & taste your wedding theme. The beauty of Lemon & Lime is how you can implement it in more than just colors! Key lime cupcakes, lemon drop martinis & fruit filled centerpieces are just the beginning. 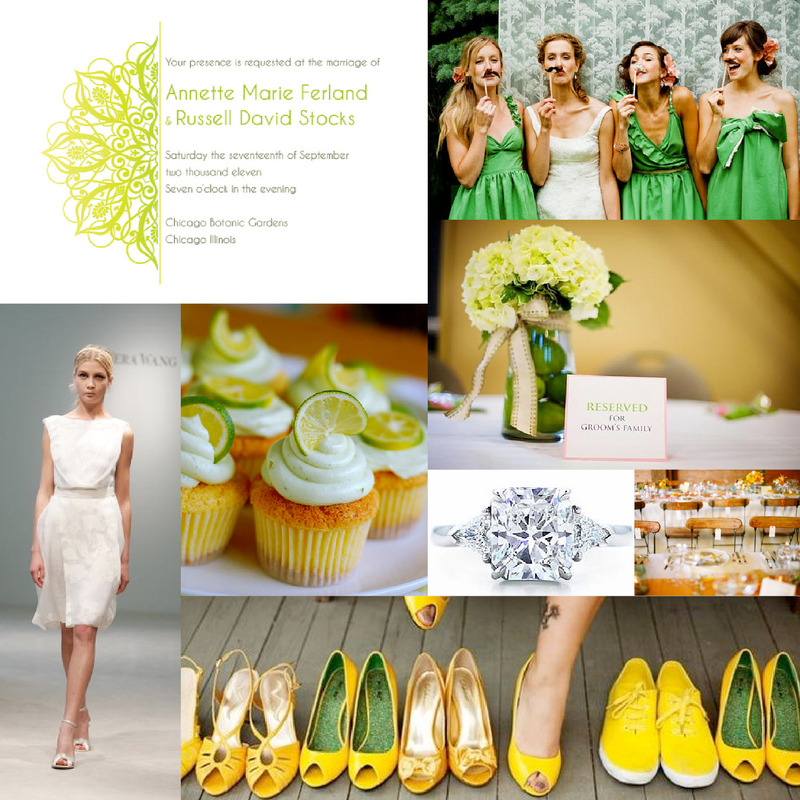 Consider the Kaylee wedding invitation design for Your festive Lemon & Lime wedding. Every once in a while I get contacted by a client who doesn’t really know what they are looking for in their wedding invites. They have their colors picked out or a theme in mind, but they are not really sure where to start with the wedding invitations. This is when it’s great to have options to choose from! 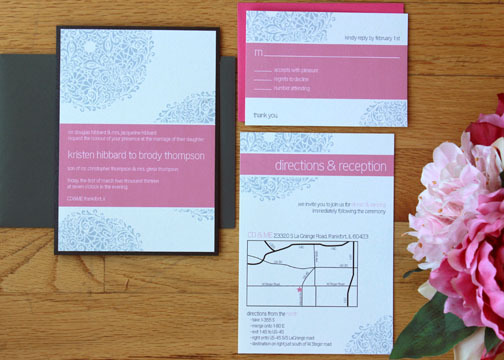 Browsing through the design gallery can help determine what you like in a wedding invite. In this case, my client saw the Gina design and her mind was made up. All we had to do was customize the colors, and change up the font to fit the vibe the bride & groom wanted to portray. We printed them on a smooth white cardstock and mounted them on a black metallic back pocketcard with gray and pink envelopes. The outcome was a bright, modern & casual feel. Browse through the design gallery for yourself to see if something catches your eye! Navy & White is a classic color combination that can work all year round. It can be dressed up for a formal wedding, or made casual for beach reception. The high contrast of the colors makes for a perfect setting for bold graphic designs. 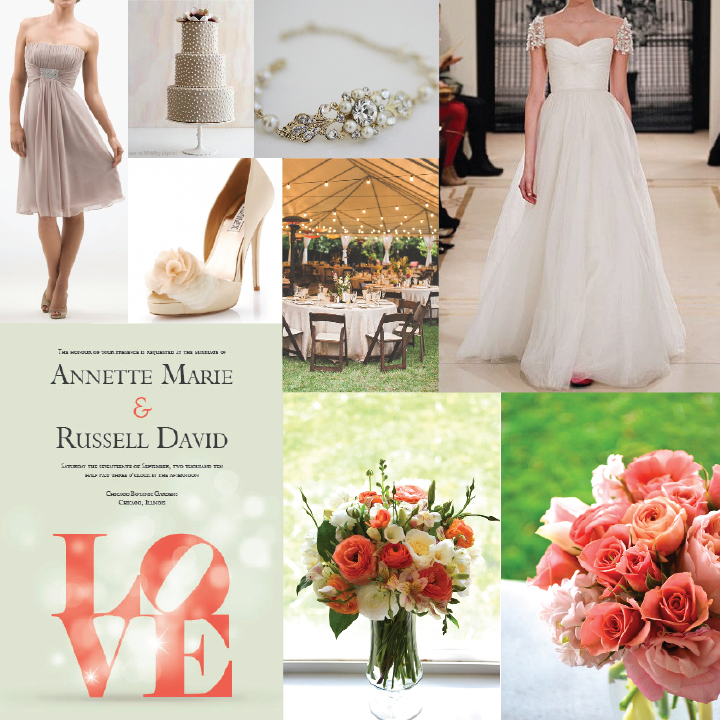 Consider using the Ava design for your Summer or Winter wedding! I love themed wedding showers! Having a theme always ties all the details together, and it’s all in the details! My client was having a wine themed wedding shower and came to me for something custom. The original direction was to possibly do something with grapes & vines, but then I had this idea! This was a fun, modern twist on a traditional concept. She decided to have matching thank you cards created to keep the theme alive! Graphic Giraffe does more than wedding invitations. Check us out for all your graphic design & invitation needs! Vintage style weddings are beautiful and very popular right now. 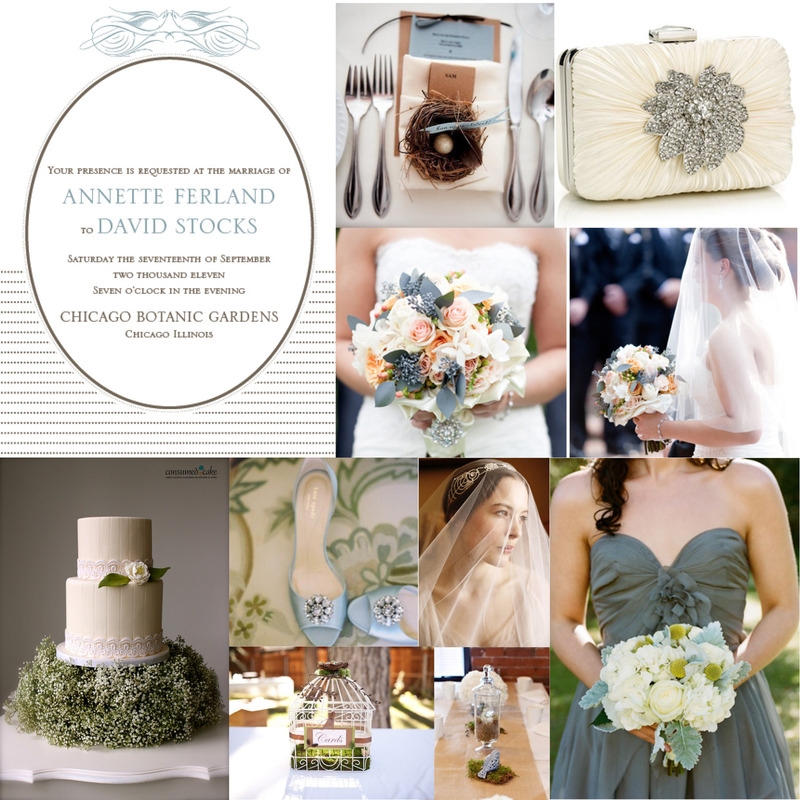 Muted colors like sea green, ivory & peach work perfectly for warm weather weddings. Consider the Fiona wedding invitation for this theme. 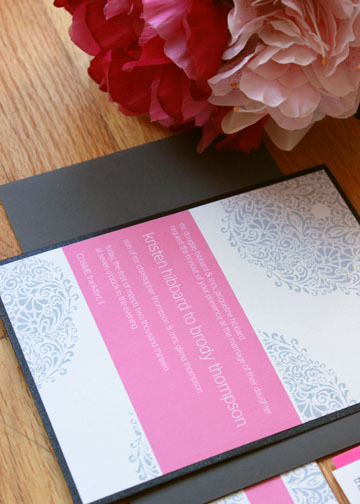 When I was contacted by this client with a request to create invitations with lace, I was elated! I love everything about lace and adding it to a wedding invitation was a perfect combination in my mind! My clients theme for her wedding was “Pearl & Lace”, so I knew right away, we had to use a metallic stock paper for the invites. I found this lace that had gold thread running through it, and knew it would be perfect! Since the lace was the focal point of the invite, we kept the design simple & minimal as to not take away attention from the quality of the materials used. 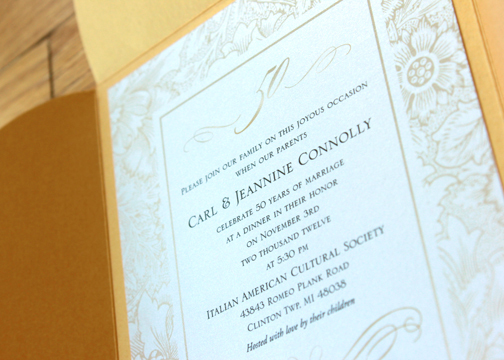 And with all the information that needed to be communicated in this invite, using a gold leaf, front & back pocket card to hold the extra inserts, kept everything neatly packaged, while still allowing the invite to be front & center. 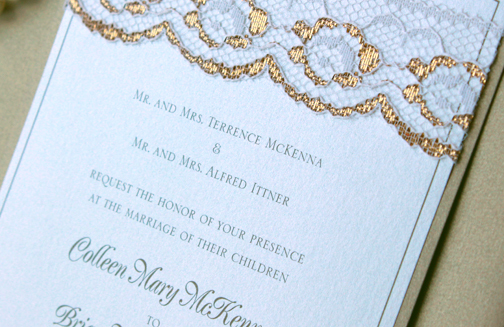 You may think adding lace to your wedding invitation is out of your price range. 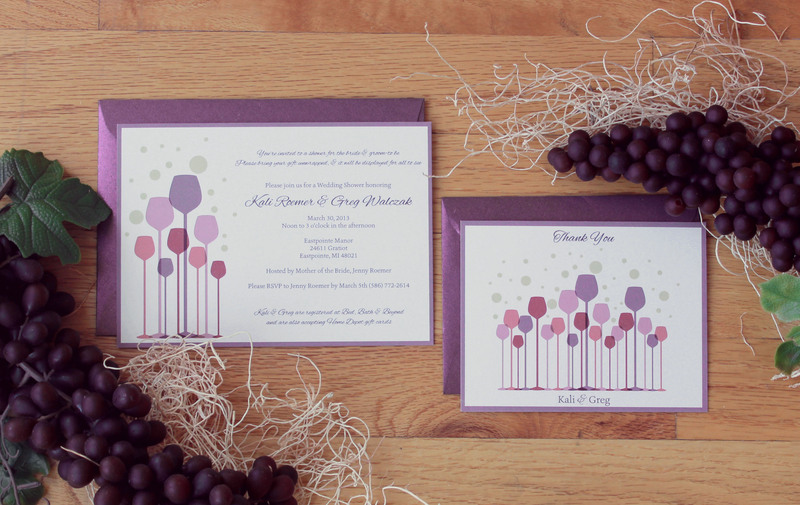 But if you designer style on small budget, these high-end invitations can still be for you! When you work with Graphic Giraffe, you not only get the best prices for custom wedding invitations, but you get the options to flex your spending. If you have a little DIY spirit in you, you can save some money by doing the assembly yourself on wedding invites like these. Graphic Giraffe can do the design & printing and then send you all the supplies for you to do the final product together yourself to help you save some money! O course if you don;t have a creative bone in your body, we can do it all for you (even down to addressing the envelopes) and send you the final product ready to go! 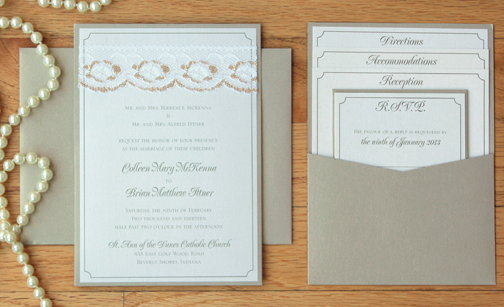 Consider adding lace or fabric to your wedding invitations! New to the Graphic Giraffe Blog! 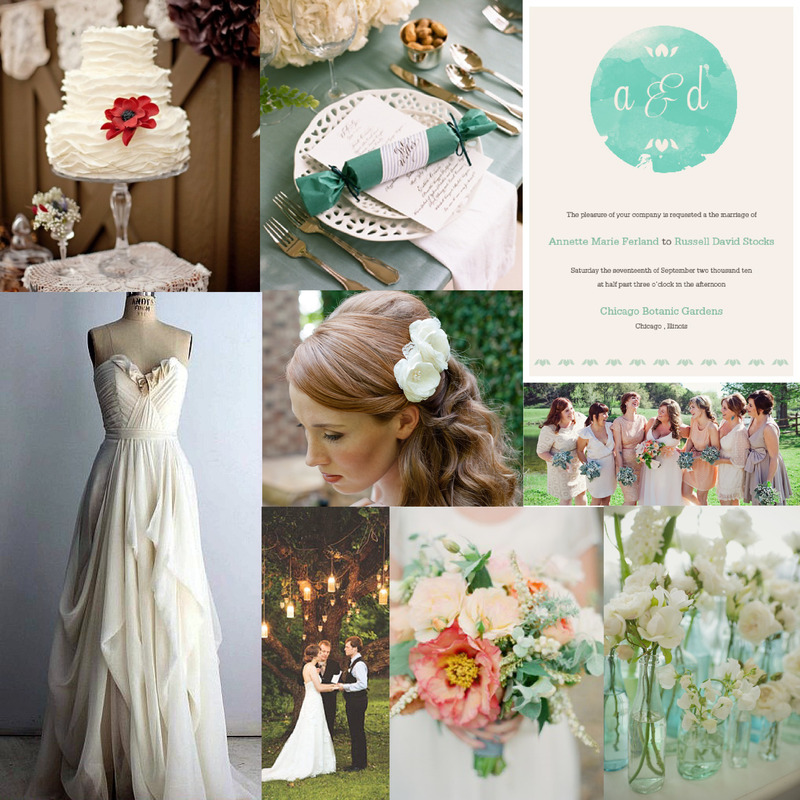 Every Wednesday will feature a new wedding inspiration color board. Check back every week for a new theme! This is a beautiful color combination for a Summer wedding. Bright, fresh colors and soft fabrics work for a traditional or modern wedding. Consider the Charlene wedding invitation for this theme. I recently had the opportunity to create some 50th wedding anniversary invitations for a dear friend of mine’s parents. Of course we were going to use gold as the main color (traditionally 25th wedding anniversary are silver, 50th is gold! ), but with the quick turnaround time my friend needed, there was no need to recreate the wheel for some invitations. 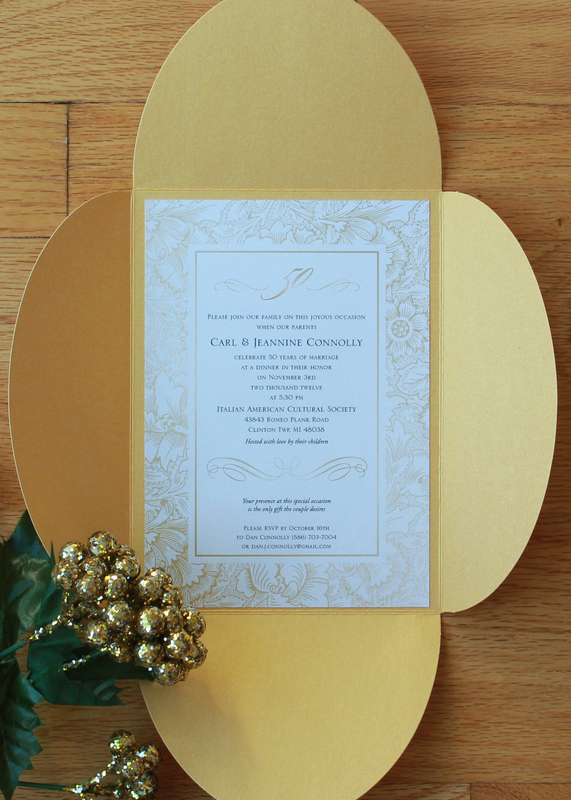 She ended up using an existing design from the wedding invitation design gallery, Suzette, and we gave it the King Midas touch to make it gold! 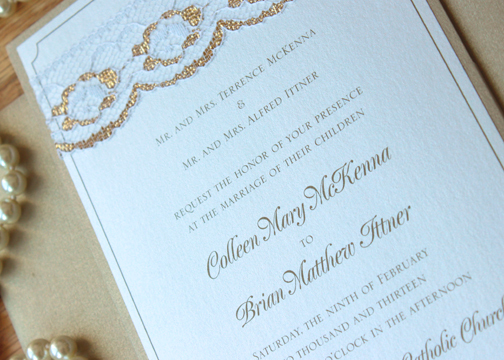 A simple color change to an existing design can really make an invite look completely different and totally custom! And choosing the right paper for the project makes a world of different. We went with a metallic crystal stock for the invite, which really gave this golden anniversary invite the shimmer of gold! 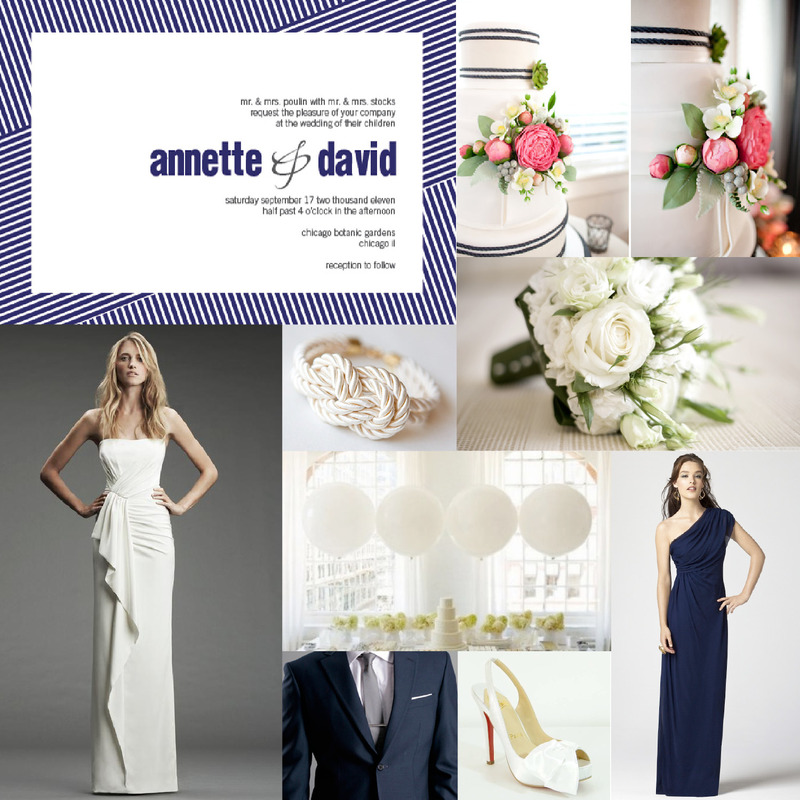 Consider a pre-designed template for your wedding, shower or anniversary invitations. We can customize the colors and fonts to fit your theme!